New Items Arriving Daily! Check Out Whats New Today! Exotic Woods Drop Spindles are completely restocked - dozens of exotic hardwoods create an array of beautiful drop spindles - no two are alike! Currently on our shelves Lignum Vitae, Kingwood, Rosewood, Purple Heart, Redheart, Teak, Mora and Myrtle plus more arriving as quickly as they are turned! 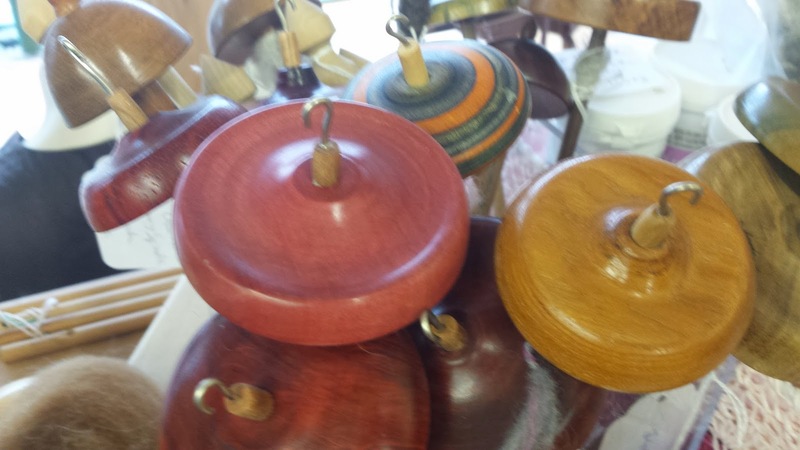 Each spindle is lovingly hand-turned in our workshop and made especially for you. Straight off the drying racks is our New England Farm Wools and Alpacas. 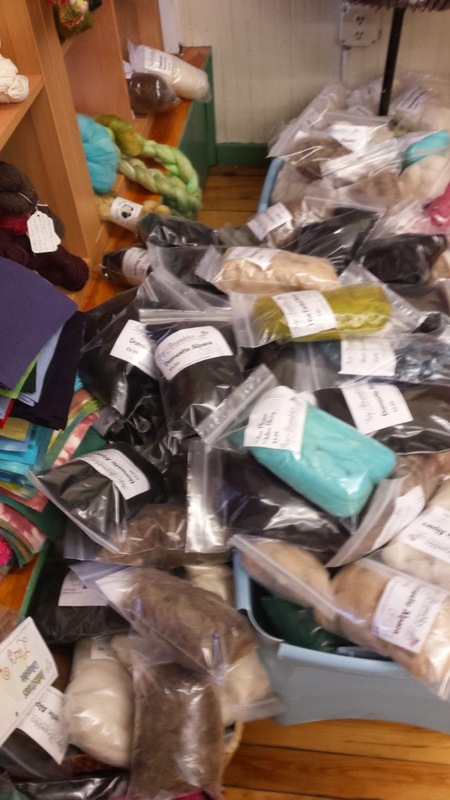 We have been busying scouring and dying fibers from local farms for your spinning and needle felting projects. We have a great mix of natural colored as well as kettle dyed fibers packaged in one ounce bags for your enjoyment! Some examples of different fibers include Border Leicester and Lincoln Locks, Shetland, Alpacas and a variety of wools. Stock up while their is an amazing selection. And don't forget to get some of the Creative Fiber Artists Needle Felting Needles now available in packs of five needles at a great price! Just in! New Cheeky Sock Bags are perfectly unique! No two bags are the same! The newer additions to the Cheeky Sock Bags include mischievous kitties, herds of sheep and some really sweet bags featuring witches, ghosts and pumpkins, oh my! Hello Everyone and Happy Fall! Now that the temperatures are starting to drop, put a neck cowl on that will chase the chill away! Introducing another beautiful (and free) pattern - The Ivy Bramble Spiral Galaxy Neck Cowl. This simple, easy and fast neck cowl spirals around with an easy repeat that continues through to the end of the cowl. And because this neck cowl only needs 100 grams of chunky yarn, it becomes a perfect cowl for gift giving! 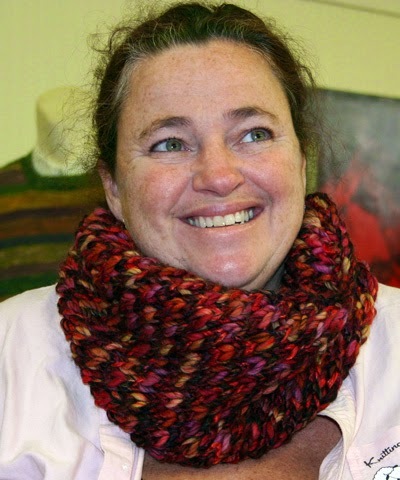 The cowl I am wearing is made with 1 skein of Berroco Borealis yarn - I have seen a lot of the cowls as our classes have grown very fond of them - and all the colors work! Others yarns that also work (in the one skein range of course) are Ivy Bramble Superwash Chunky, Plymouth Baby Grande Alpaca (so soft! ), and Berroco Peruvia Quick. Another favorite has been the Berroco Lodge, but you need two of these! Here is a quick link to all of our Chunky Yarns to assist in finding your favorites. Or visit our shop to see them in person and we can help you pick some new favorites. Have a great day and keep warm! KWF Big Needle Infinity Cowl is Warm, Soft, and a Really, Really Fast Knit on KWF US 35 12 inch needles! 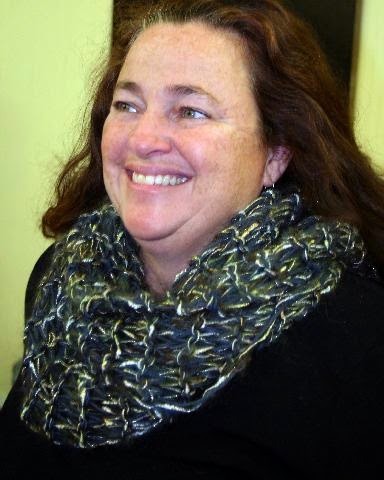 I'm smiling because I am wearing the new KWF Big Needle Infinity Cowl and it is warm, soft, and a really, really fast knit on size US 35 12 inch needles! This scarf measures 10 inch wide and 7 feet long before joining into a scrumptious and takes about 2 to 3 hours tops to make. Straight garter stitch and a beautiful choice of yarn and you are on your way putting a big smile on someone you love! Above cowl shown in 1 skein of Ultra Alpaca Slate 62113 and 2 skeins of Trendsetter Dune Color #100. Yarn kit with free pattern available when you click here. This cowl was created using the Made in NH hand-made KWF Big Knitting Needles Size 35 (19 mm) 12 inch (300 mm) needles. These needles are perfect for big stitch projects and you will use them over and over! New Products Are Arriving! Today, Hand Dye Kits from Ivy Brambles Hand-Dyed Yarns! 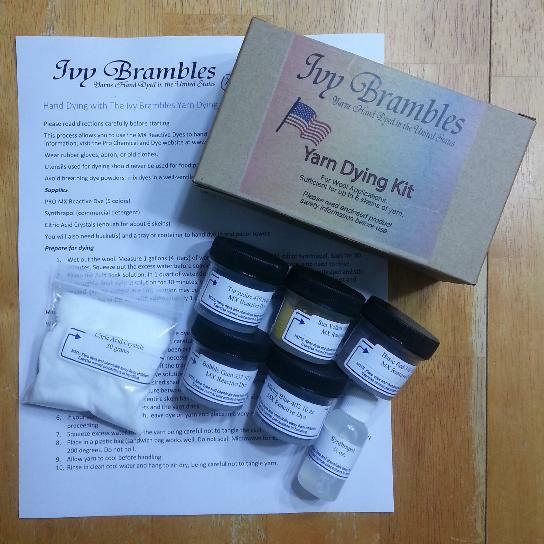 A new product has arrived at The Yarn and Fiber Company - Hand Dye Kits from Ivy Brambles for dying natural wool and silk yarns! Kit includes everything you need to venture in to the world of dying! For best results add some creativity, enthusiasm and, may we recommend using natural yarns from the Ivy Brambles line - Superwash Worsted, Sockscene, Superwash Chunky or the lovely Romantica Lace yarn - all available for your dying projects to create your own uniquely dyed yarn! There is enough dye for at least a dozen skeins of yarn, so enjoy yourself! Gather your friends and order a few kits to create a dying party at your place or ours! Call 603-505-4432 and ask for Cyndi for more details on your personal dying party. Great for guild meetings, birthday parties and more!